In each episode, teams will face two grueling challenges. First, they’ll face off in the Small Scare, where they must create a Halloween-themed design in just 45 minutes. One winning team gets an advantage in the big battle – the Spine Chiller. In the end, their creations will be judged by renowned cake decorator Shinmin Li and writer/director of the iconic Halloween horror film Child’s Play, Don Mancini, and a rotating panel of celebrity guest judges who are legends in the horror genre, including Elvira, Mistress of the Dark, Sid Haig (Halloween), Greg Plotkin (Director of Paranormal Activity: The Ghost Dimension), Bitsie Tulloch (Grimm), and Carlson Young (Scream). One team will be eliminated after each episode. 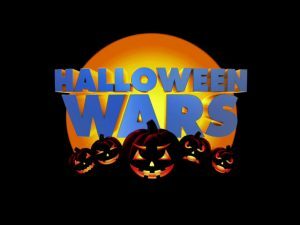 In the end, only one team will be declared Halloween Wars Champion by host Jonathan Bennett, and walk away with a $50,000 grand prize. Halloween Wars returns, as six teams made up of an expert pumpkin carver, cake decorator, and sugar artist go to battle to create mind-blowing Halloween-themed displays, in hopes of winning the coveted title of Halloween Wars champion and a $50,000 grand prize. For the first challenge, the six go to battle to create displays that capture an epic and terrifying clash between witches and warlocks. In the end, one team will be eliminated. Special guest judge, Elvira, Mistress of the Dark joins host Jonathan Bennettand judges Shinmin Li and Don Mancini. The five remaining teams made up of an expert pumpkin carver, cake decorator, and sugar artist compete to create mind-blowing and delicious Halloween-themed displays of the scariest haunted roadside motel ever seen. Judges Shinmin Li, Don Mancini and special guest judge, actor and horror icon Sid Haig from the classic movie Halloween, will help determine which team will be eliminated. It’s the horrifying finale of Halloween Wars. The final two teams made up of a pumpkin carving expert, cake artist, and sugar artist go head-to-head one last time. Only the team that can best capture the scariest and most demonic wedding ever imagined will be crowned Halloween Wars champion, and win $50,000. Special guest judge actress Bitsie Tullochfrom Grimm will join judges Shinmin Li and Don Mancini to determine who wins.